This was our contribution to Karen and John's annual Halloween luncheon ~ Sonny's daughter manufactures and markets Figgs Hot Apple Pie drink mix. 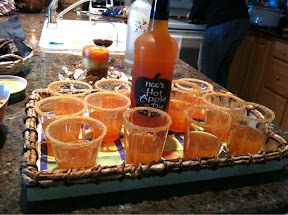 We rimmed glasses with Carmel sauce and raw sugar and added a little adult beverage ~ very festive! 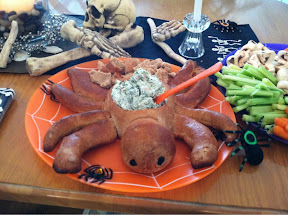 All of their food has a scary theme ~ always fun!! From there we went to Kelley's Island and this was the first fun guy we ran into! 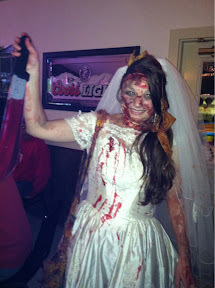 She wasn't too fun but definitely a creepy costume! Such a sweet/odd couple Rosie and her man friend!! You have to guess which one's Rosie!!! 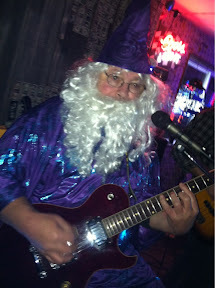 A member of the band at Bag the Moon Saloon! And a nice old couple having so much fun!!! Happy Halloween from spooky old Alice!!!!!! Last week, we spent four days at The Woolley Fox in Ligonier, Pennsylvania. 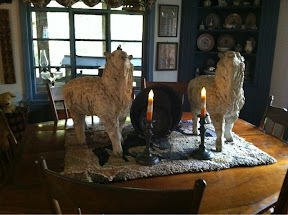 This is the dining room table in Barbara Carroll's home ~ isn't this the greatest centerpiece? These papier mâché sheep are really unusual ~ wanted to put them in my suitcase but I thought better of it!! 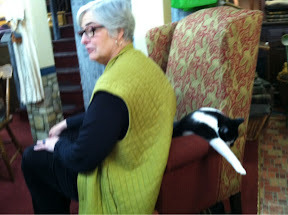 Donna had to share her chair with Gabby, one of the resident house cats ~ pretty funny! 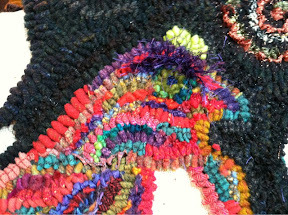 Since Donna is our leader, I am especially embarrassed that I didn't take a picture of her rug ~ Oh Deer ~ nice and dark! 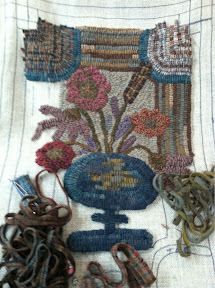 This is Kathy's rug ~ she drew the floral insert and it's going to look really old. Behind this rather large rug is Maria and she says to tell you that she is smiling! Maria drew her own pattern and the thing I love is the purple tree! Party Henny is going to be quite a stunner ~ lots of sparkle and she even has eyelashes! In case you wonder ~ yes, that's my rug!! Minnesota Mary was also with us and I didn't get her rug either! I couldn't believe it when I figured it out on the way home! 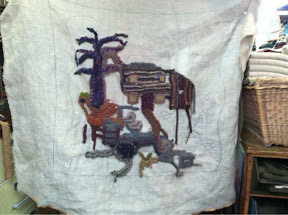 She is doing the new Magdalena, Animal Parade ~ one big rug and Mary's is well on it's way! I added that one to my pattern stash, too, but have no idea when I'll do it! We had much fun as always and I look forward to hanging out with them again! Thanks to Donna for putting it all together! We got word this weekend that Emma Lou Lais passed away Thursday. The rug hooking world has lost a shining star ~ such a sweet woman! I took two classes from her when she taught at Aults years ago ~ a real treat for anyone who was fortunate enough to have her as a teacher! Back to reality now ~ office work and hopefully some intense hooking time!! Take care and enjoy the Indian summer that's coming this week!! What a busy week! Wednesday was the wholesale markets in Columbus ~ I love to go shopping there ~ didn't find a lot for my booth but did pick up a couple of things from David T. Smith's booth. I love pottery with figures on the top ~ and sheep! Also love, these chimney-type pieces! This was one of a kind, done by one of their new potters. Love the bats and cutouts! I met my friend, Lori, and we went to the another market on the other side of town. After that we went to lunch at a French restaurant, La Chatalaine! Yummy omelets and mimosas for a late breakfast/early lunch!! Then to a yarn shop where I saw a great scarf that I want to knit! A very fun day! A lot of other things went on this week that made for non-stop busyness all week! Last weekend, we went to Kelleys Island for our annual day with our lake friends! This crazy car was parked along the way and I knew you would want to see it!!!! The side is covered in corks but my picture was too blurry ~ I think that's because I practically jumped out of a moving cart to take it!! A good time was had by all! Today,Sonny's niece, Melissa got married to the love of her life, Max! The reception tables were so beautiful and were done by her mom and sisters!! I think they should take their show on the road!! Wasn't this cake something? I just loved the quirkiness of it ~ perfect for a fall wedding! We have a local cake shop, Maria's, that rates right up with the Cake Boss ~ or a close second!! I could make a cake like that only mine would have been an accident!! And here we are ~ my resident carpenter and me!! 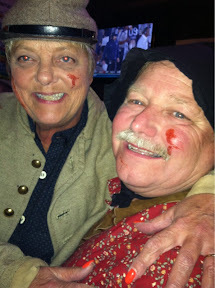 We had a very fun time ~ we're the matriarch and patriarch of the family ~ but we have a lot more fun than most!! Tomorrow morning, I'm leaving for a few days of hooking at The Woolley Fox ~ lots of hooking and lots of good food! And I love the shopping in Ligonier! Sonny is leaving to work on Kelleys Island for the week so all I can say is thank goodness that we have a great lady to stay with Tad! I'd have to hang him on a hook till I got back if it weren't for her!! Well, maybe I'd just stay home ~ I wouldn't really hang him on a hook!!!!!!!! So that's it from here ~ hope all is well in your corner of the world! 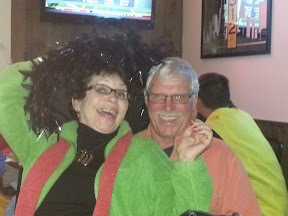 I'll try to post some pix from Barb's and let you know what fun we're having there!! Have a good week!! My resident carpenter built this new dining room table for us! 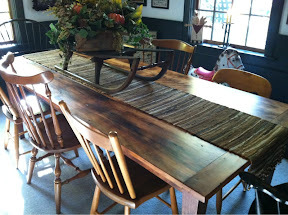 It's made from antique barn boards full of nail holes and all those character-building flaws that we love! It's got a beautiful hand-rubbed finish that shows off the grain to the max! The antique chairs that surrounded the old table look good with this one, too ~ but black Windsor side chairs would look fabulous! 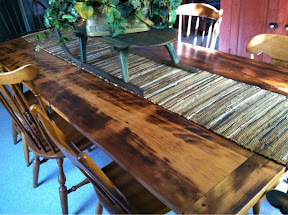 This is a view from the other end ~ I'm loving this table! Thank you, Sonny for your hard work!! He has had this in his sights for years and is really happy with the results!